When you love coffee as much as I do, your kitchen will probably show it. Espresso makers, various sizes of french presses, Keurigs and other items are probably cluttering the counter space, leaving no room for the next thing cool thing that comes up like these awesome dual brew coffee makers. It is hard to get rid of items that used to make your life easier. I used to use my traditional coffee maker on a daily basis, but slowly started moving towards things like Keurigs or pour overs. I decided a good solution to my excessive stash of coffee-making products would be to consolidate my collection. There are a lot of coffee products these days that have multiple functions. Many companies are making dual-function machines which can brew a full pot of coffee or dispense hot water, but I already have a great hot water kettle that I am not ready to replace. I decided I would combine two of my larger items, the standard 12-cup coffee maker and my Keurig. Being able to brew either coffee grounds or K-cups has helped free up a lot of space without losing the vital functions of my best items. 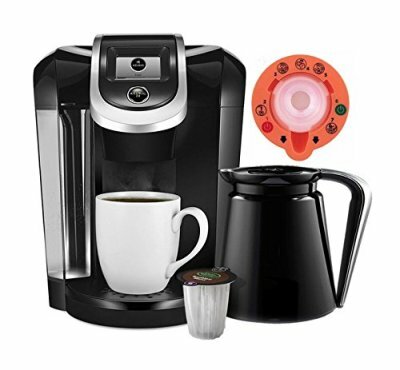 There are a few products on the market that really do a great job with dual-function k-cup and coffee brewing. Most of them are separated into two parts or sides like the 2-way Flex Brewer from Hamilton Beach. They hold coffee grounds in one side for full pot coffee and k-cups in the other for single serve portions. Other products use pods for both functions, allowing you to make a pot of coffee or a single serving, without ever having to use coffee grounds. If you are reading this article however you probably want the flexibility of being able to make a full pot of coffee with regular coffee grinds and filter papers or a cup of k-cup coffee from the same machine. 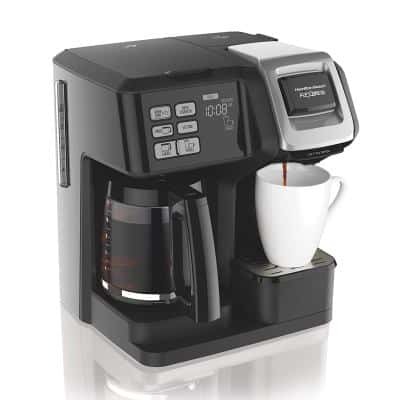 Consider the following coffee makers that brew k-cups and full pot coffee before making your next purchase. They are your best options in my opinion. 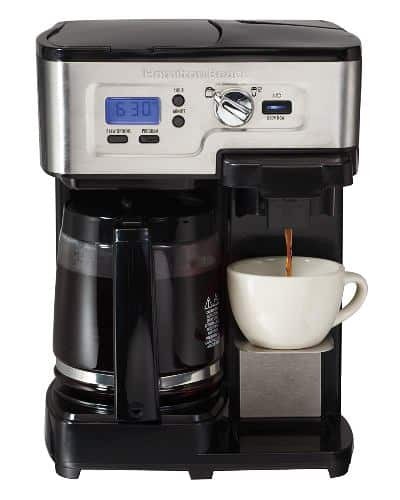 This coffee maker is a great, easy choice. Using a dual-function machine isn’t always intuitive, so I appreciate how clear this device is set up. The full-pot and k-cup sections are clearly separated, with their own distinct chambers for water. On one side, you clearly fill your machine with grounds and a filter like usual, add water, and brew up to 12 cups. The other side has its own water chamber and opening for insertion of a k-cup. The needle to pierce the k-cup is removable, allowing for easy clean up and the k-cup brewer can be converted to a single serve loose grounds brewer if you want to stop using k-cups down the road. This is a great two-in-one product and very simple to use. See pricing for this unit on Amazon here. 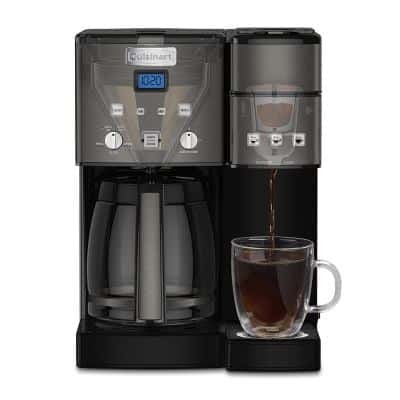 This dual-function machine is very similar to the last two It has a separate carafe allowing for 12 cups of coffee as well as a separate side with k-cup functionality. What makes this one stand out is the gold-tone coffee filter that comes with it. This is a great feature as it eliminates the need for paper filters on the carafe side and it gives you something a form of unfiltered coffee where you get more of the coffee oils and more of the body people associate with a french press. Including the reusable filter was a smart, environmentally-friendly decision for this company and for people who want to use paper filters anyway they fit nicely right into the reusable filter basket. The overall look of the machine is very elegant, with a handle on the carafe of BPA-free stainless steel. You can see pricing for this 2-way coffee maker here on Amazon. This Two-Way coffee maker is a lot like the first machine featured in this list, this one however is laid out differently and is a bit simpler to use. The coffee maker uses just one water chamber, and the user simply selects whether they will be brewing a k-cup or ground coffee. The machine takes care of the rest. The 49983 FlexBrew includes additional customization options for making either bold or regular coffee at the touch of a button. It also includes a timer on the carafe side as most coffee pots have these days so you won’t have to worry about forgetting to turn the machine off. If you just want to brew a single cup, but not use a k-cup, you can also just pack the single serving side with grounds and make one cup of coffee. The machine is very durable, with removable dishwasher safe parts. This is basically a step up from the more basic model FlexBrew but the pricing is still quite affordable. You can see current pricing for this model on Amazon right here. The Keurig K300 and K350 are two-in-one brewing machines that brew single cups and pots, however they do not make 12 cup carafes like the other options on this list. They can brew up to four cups at a time in its own Keurig branded “mini” carafe. For someone who is really into the convenience of making coffee out of a pod, but not ready to give up their multiple-cup-at-a-time brewing habits, this would be a perfect choice. This Keurig machine uses k-carafe pods to brew pots of coffee. If you are ready to be done with different varieties of coffee beans, especially when it comes to storing the coffee, using k-carafe pods is a great alternative. This machine doesn’t just brew k-cups and k-carafe pods, though. It has settings for other drinks, such as chai, mochas, and even hot cocoa. If you like variety in your daily drinks, this may be the right option for you. You can see pricing on the K300 on Amazon right here. The K300 and K350 models are now discontinued. They have since been replaced with the newer K-Elite model which is a single cup machine only. The newer K575 however can also brew into small Keurig carafes making this the best alternative. You can see pricing and specs on the K-575 here. You can also see a head-to-head comparison of the K-Elite and the K575 here. There aren’t a lot of options on the market for a coffee machine that allows you to both brew a k-cup or full pot. You’ll want to consider a few things first. Think about what function you will be using the most. If making full pots of coffee isn’t really your thing, you might not need a machine that focuses half of its functions on brewing coffee grounds. If you just want to be able to brew a decent amount of coffee for a long morning, or to entertain some guests on occasion, the Keurig 2.0 is a great choice. You won’t need to keep coffee grounds around, and you can just keep some K-Carafe cups on hand for when you need to make more than a single serving. If you like making full pots of coffee with coffee grounds, the Keurig machine might not be the best choice. The Cuisinart would be a great alternative, because a lot of the attention in the design is towards brewing with coffee grounds. Is a combination machine just as good as their individual parts? All of the machines in this list are high-quality coffee makers. Many offer warranties guaranteeing you will see a long life with them. None of the processes from these dual brew coffee makers are compromised by being packaged in a dual-function machine. The Hamilton Beach coffee makers are a great example of this. They’ve simply slimmed down the size of a coffee maker and a Keurig machine, but kept the functionality. They aren’t ever going to make a pot of coffee as good as a Moccamaster but it’s going to be just as good as that Cuisinart you’ve been using for the past decade. What is a K-Carafe pod? A K-Carafe pod works in the same way a K-Cup works. If you are familiar with using a K-Cup, this will not be a challenge at all. These pods are able to brew up to four cups of coffee at once into a special Keurig branded carafe that is typically sold separately. This is of course in comparison to the normal single serving that a K-Cup produces right into your mug. There are a lot of varieties to choose from and using a K-Carafe allows you to switch up your morning brew more often than a typical bag of grounds and it allows you to brew more coffee at once with your Keurig machine. K-Carafe pods are only usable in certain Keurig models and so far there aren’t any other brands that make coffee makers able to brew k-carafe pods. How do I Clean a Coffee Maker That Brews K-Cup and Full Pot Coffee? Depending on the function of your maker, some parts can be disassembled and put in the dishwasher. A simple way to clean a coffee maker is to run water and vinegar through the chamber as if you were brewing a pot, but do not add any coffee. Once filled, empty the carafe and fill with hot soapy water. Clear the carafe and run water through again to clear the excess vinegar. With the k-cup side, you can disassemble some parts and clean them either in the dishwasher by hand. If the needle is not removable, you can use a clean paper clip to scrape around any excess matter. 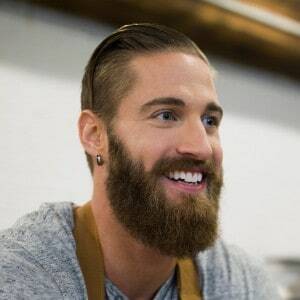 Generally you have to clean both sides of the coffee maker independently of each other… as if you were cleaning two different machines back-to-back. Does Keurig Make a Dual Coffee Maker? Keurig doesn’t exactly make a 2-way coffee maker. Their newest K-Cafe line of machines can make single cups, small carafes, and mixed espresso style drinks but they don’t make these machines to be capable of brewing regular coffee grind in addition to the k-cups. If you want to be able to brew either k-cups or regular coffee grind without having to refill a small reusable k-cup grind holder every time then you have to branch out of the Keurig brand. Obviously Hamilton Beach is the biggest player in this market as their Flexbrew line of dual coffee makers are some of the best around and there are so many of them priced attractively to choose from. So, What’s Going to Fill Your Cup? The market for a coffee maker that brews k-cup and full pot coffee is somewhat slim, but that doesn’t mean there aren’t great products out there. Hamilton Beach Flexbrew machines for instance are very much worth their price tag. In fact, all of the dual-function coffee makers in the list above are high quality and effectively machines that make a great pot of coffee. They are all also very good at making a single serving with a k-cup. My favorite part about having a machine that can do both is having the ability to brew just one more cup if that’s all we need. It is nice to have guests over, share a pot of coffee, and easily throw in a k-cup for the person who wants just one more… or for the person who wants a random cup of coffee in the afternoon. Choosing a dual-function machine is a great choice for the coffee lover who brews a lot at home. Not only can you conveniently save time in the morning, these machines also save counter space. Purchasing one can help consolidate your coffee equipment and declutter your countertop without losing any of your favorite functions. I’ve found that the Cuisinart model fits my needs, as it is simple and clear to use. It effectively brews both of my favorite types of coffee. I was drawn to this one because of the simplicity, but also the filter that comes with it. Buying coffee filters is a huge hassle for me, and I often try a makeshift napkin filter before giving up and going to the store. Eliminating my single-use coffee maker and the need to buy filters has been a great relief. Before making your next purchase, be sure to keep this list of best coffee makers that brew k-cup or full pot coffee in mind. Each machine has unique features, and it’s important to apply your own needs to your purchase.